Prev Quiz: Do You Need to Simplify Your Life? (+ $300 TargetGift Card Sweepstakes) Next Help! We’re Moving & Driving Each Other Crazy! I am a big fan of reading magazine articles, books and websites on decluttering your home. However, I am not such a fan of actually doing any decluttering. There are many cabinets and closets, overflowing with neglected items, of which I am woefully embarrassed. However, the thought of cleaning and organizing them is quite overwhelming. So, when a project for Goodwill came across, I jumped at the chance. A project deadline, is really what I needed to accomplish some decluttering. And yet, I still procrastinated, waiting until the last day. To me that indicates I have clear emotional aversion to organizing these hot spots in my home. 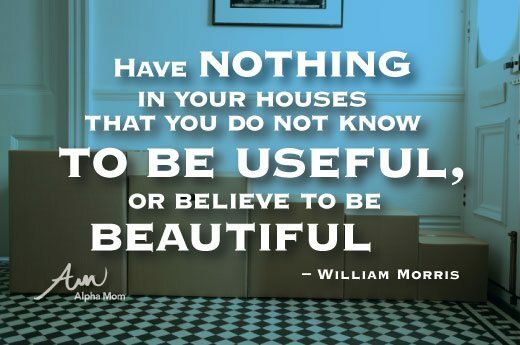 It’s by William Morris and it reads “Have nothing in your houses that you do not know to be useful, or believe to be beautiful.” Gretchen Rubin thinks it’s a great way to identify clutter. At first, it was my guiding principle, but then I realized it didn’t necessarily take into account keepsakes, the items that may neither be useful nor beautiful, but for which you still have an attachment. While decluttering for this project, I found this to be the case with my son’s childhood items in particular. At first, my plan was to tackle 1) my clothes closet, 2) my office closet, and 3) one kitchen cabinet that has effectively become a place for me to store junk. I started with the kitchen cabinet. This three-shelf kitchen cabinet had become a catchall for random mugs, plates, and unused appliances. Also, when I have visitors I tend to shove some of the clutter on my kitchen counter in there. I don’t think I’ve looked closely at the top two shelves in over 5 years. That’s really embarrassing since it’s prime cabinet real estate. With my plan for keeping only (1) useful, (2) beautiful, and (3) meaningful items, I forged ahead. And you know what? It wasn’t bad. AT ALL. In all, that kitchen cabinet was decluttered in one hour. Some thoughts on the items above: The decision to donate or keep these items was relatively easy. 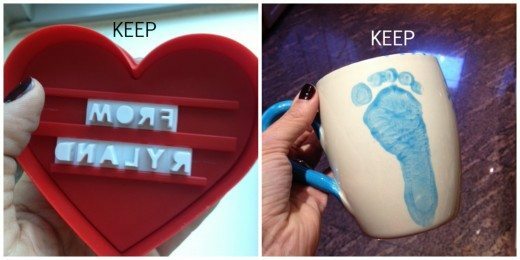 Except, I changed my mind about two of them: 1) once I saw that my son’s name within the heart-shaped cookie cutter I couldn’t give it up. However, if it doesn’t get used by next Valentine’s Day, it’s being donated. 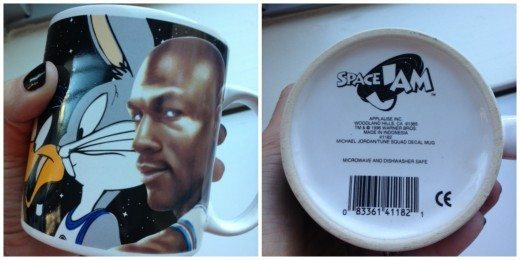 And, 2) the Michael Jordan/Space Jam mug was in the donate pile until I realized that this is a memento from a project of my husband’s. See that Columbia University Dining Services mug? I have had that since my freshman year in college, 25 years ago. I haven’t used it in decades, and yesterday was the first time I was willing to part with it. Keepsakes sure are the hardest. 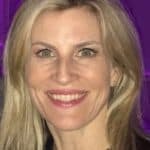 Looking back on the five tenets I listed above, I think numbers one (know to whom you are donating) and five (set reasonable goals) really worked the most to motivate me. At first, I was going to also tackle my clothes closet and office closet. But, I was really proud of myself after I cleared out my kitchen cabinet in an hour. I stopped after that. I wanted to end on a high note so my most recent memory of decluttering would be a positive one of accomplishment. When I do tackle the other areas, I’ll be motivated rather than dreading it. Also, knowing that my (albeit modest) donations will be going to a non-for-profit like Goodwill, which will then resell my in-good/ new condition items at its thrift shops to fund employment and job training programs, gave me the extra motivation. In Manhattan, there are nine combo Goodwill stores/ attended donation centers. Two weeks ago, when I was in the Sarasota/ Bradenton-area of Florida, I saw many very large Goodwill locations along a daily 13-mile route I took. A cab driver told me that the Goodwills have been incredibly helpful to members of their community. I learned that every 33 seconds, someone earns a job with the help of Goodwill. Not only is Goodwill a large employer and job trainer for those with disabilities, lack of education or job experience, it also partners with large companies and US government agencies to provide commercial services. Donations go to fund education, job training and placement. It is with pleasure that I am donating my household goods and I’m excited for next weekend when I’ll finally tackle my closet and donate some more. Have items to drop off at Goodwill? Use their national online locator and check the box for “Donation Site” to find the Goodwill drop-off location nearest you. Donating a lot of items? Some Goodwills offer donation pickup services. This post was made possible through the support of Goodwill. All opinions are my own. Goodwill is a wonderful organization. There’s a Goodwill bookstore we can walk to from our house and my kids love donating books, then buying used books to take home. This is a great post and exactly what I needed to read! Thank you.